It’s a known fact that celebrities look amazing at all times, although this is because they have more money than we could ever dream of having. Luckily, the high street is our saviour, and gives us much cheaper lookalikes, so we can pretend we’re Beyonce all day, everyday. So, as part of Style Week, we’ve trawled the shops to find you high street versions of 12 of our favourite celebrity Instagram looks, and, thank the shopping gods, nothing is over £100. Queen Bey loves an outfit shot or two on Instagram, and this casual look is just so perfect. Double denim shouldn’t work but, paired with this red and black checked cape and red lippy, it really does. We can’t all get Beyonce’s curves or talent, but we can get this look! 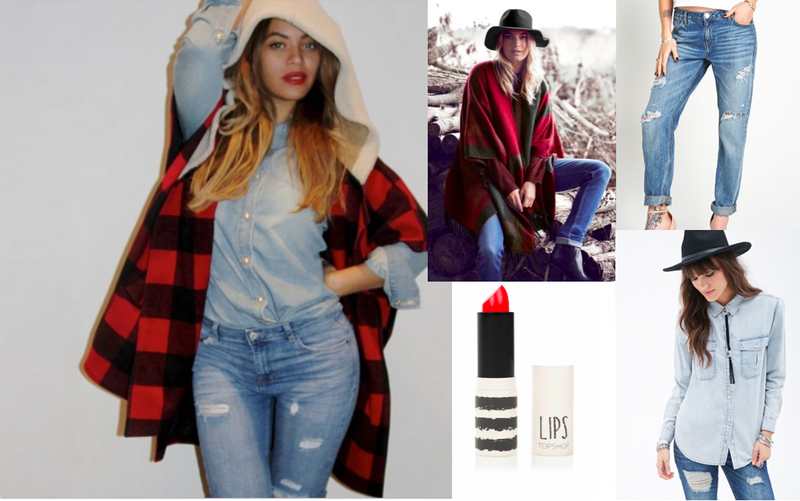 We’ve found you a similar light denim shirt from Forever 21 for £13, ripped darker denim boyfriend jeans from Very for £29, a red and black checked cape, sadly minus the hood, from Next for £25 and, to complete the look, Falling Fast lipstick from Topshop for £8. Taylor Swift always looks like a princess, and this outfit is just so effortlessly girly. She really does stand out from all her ‘cool’ friends wearing black. While the look is quite low-key bride, it’s still easy to pull of even if you’re not getting married! 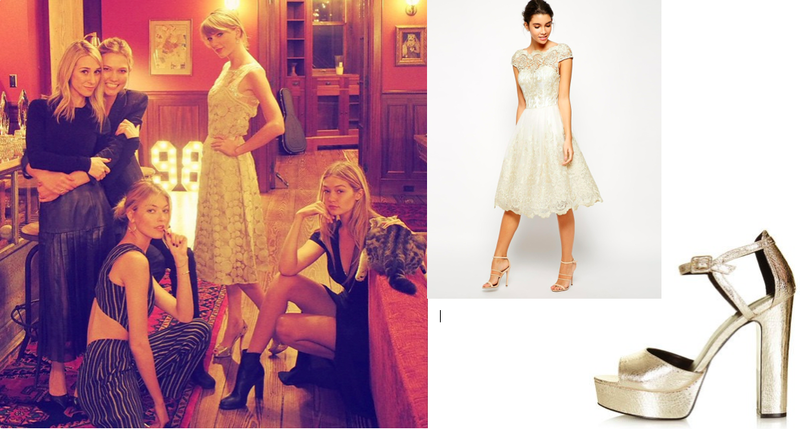 We’ve found you a similar Chi Chi London dress from ASOS for £67, and metallic sandals from Topshop for £56. 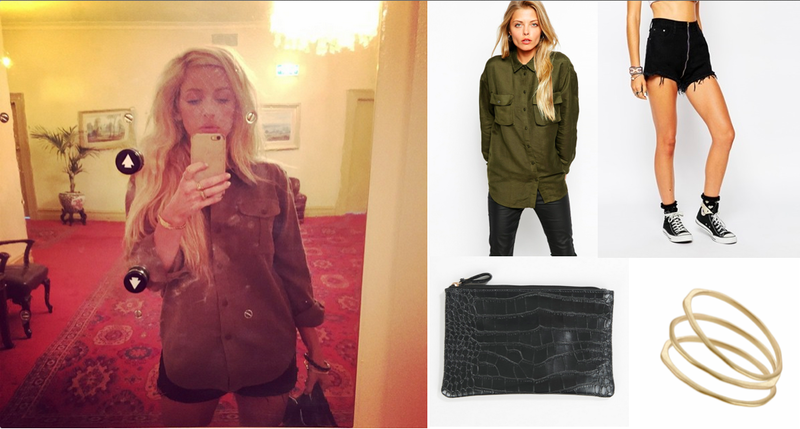 Ellie Goulding’s look in this Instagram post is so effortlessly chic, and can be dressed up or down depending on the shoes. We’re loving that she’s chosen to take a selfie by a lift as well, as we’re definitely guilty of doing this too. We’ll forgive her for the horrible hair extensions though. We’ve found you similar shorts from Your Eyes Lie on ASOS for £28, a black clutch from Pieces on Atterley Road for £9, a khaki shirt from ASOS for £30, and a pack of bangles from Topshop for £10. While a TOWIE cast member wouldn’t usually be the first we’d think of when it comes to fashion, Lauren Pope has actually worn a lot of outfits we’ve really loved recently, and this is just one of them. It’s a great outfit to wear to a bar, and shows that crop tops don’t always require you to flash all of the flesh. We’ve found you a similar white crop top from Boohoo for £5, a lilac midi skirt from Missguided for £20, white high heeled sandals from Nelly for £17.95, and an animal print clutch bag from La Redoute for £19. Emma Watson can do no wrong when it comes to fashion. We’d never have thought of pairing a flannel shirt with a maxi skirt, but she pulls it off effortlessly, showing us how to wear a maxi skirt casually. 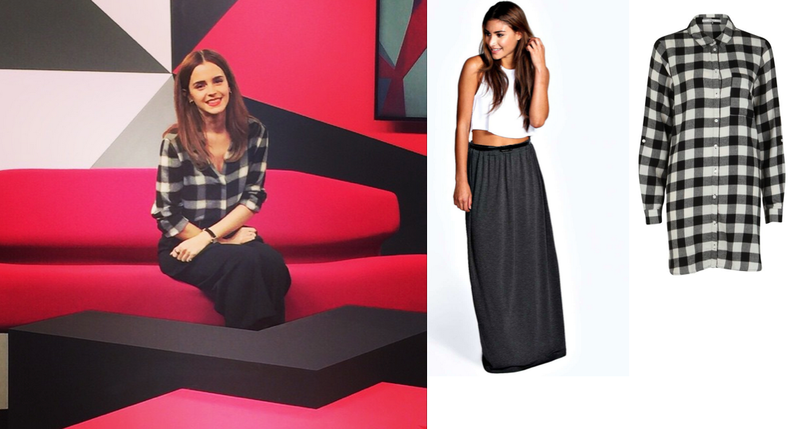 We’ve found you a similar charcoal maxi skirt from Boohoo for £12 and a flannel check shirt from USC for £20. It may be the scenery that makes this outfit look more gorgeous than it actually is, but you can’t deny how chic Kate Bosworth looks wearing a teddy bear coat and fedora. 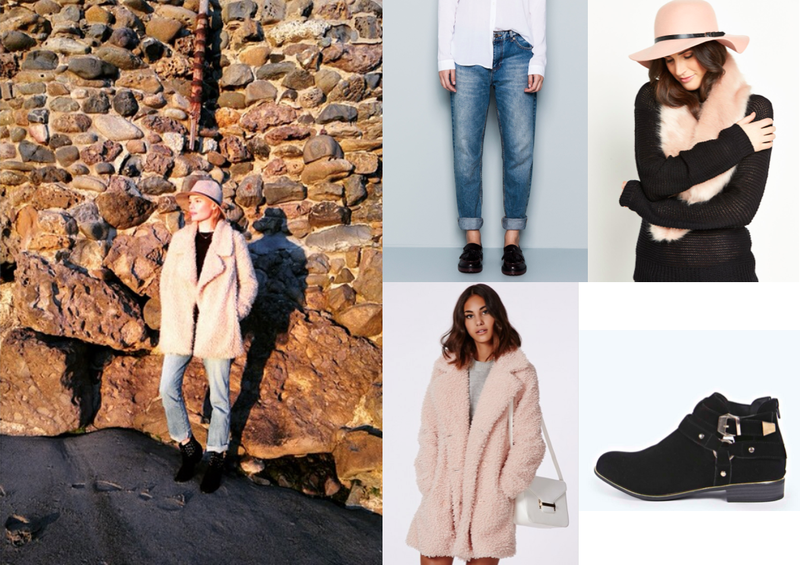 We’ve found you similar boots from Boohoo for £22, a fedora from Very for £16.25, boyfriend jeans from Pull & Bear for £25.99, and a pale pink teddy bear coat from Missguided for £30. It may be Reese’s amazing legs helping make this playsuit look all the more stunning, but this outfit is so easy for anyone to pull off, and is great for that city break you’ll inevitably be taking this summer. We’ve found you a similar floral playsuit from Quiz for £24.99 and white wedges from Forever 21 for £19. OK, so it might just be Olivia Palermo who can pull off this look, seeing as she’s the most stylish woman in the entire world, but we can try a polo neck jumper and a-line midi skirt. We’ve found you similar court shoes from Dorothy Perkins for £17.50, a white midi skater skirt from Glamorous on ASOS for £26, a black blazer from Pull & Bear for £25.99, and a black polo neck jumper from Heine on Kaleidescope for £45. We’ve always thought that clashing animal prints would look incredibly trashy, but now we’ve seen this look on Diane Kruger’s Instagram, we may just have to start doing it. 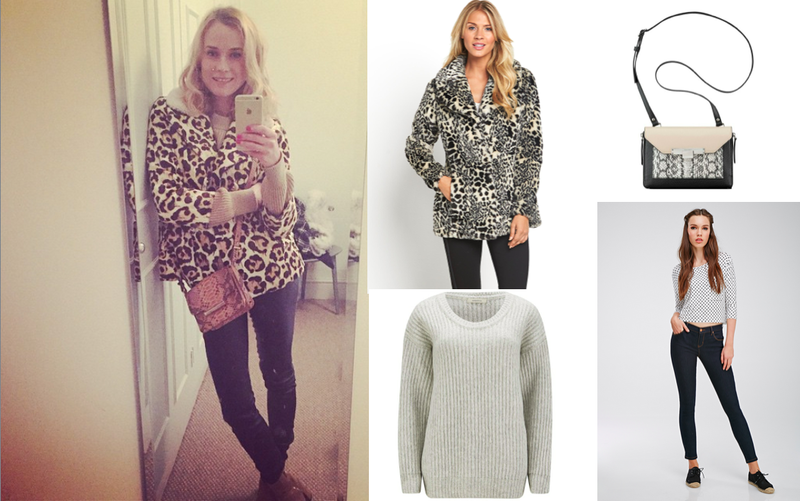 We’ve found you similar indigo skinny jeans from Forever 21 for £7, a snakeskin cross body bag from Nine West on Macy’s for £56.47, a chunky knit jumper from Coggles for £56, and a leopard print coat from Isme for £55. Mindy is our absolute style crush. She always looks amazing, pulling off her curves so well. Who knew that blue and green could be worn together? We’re loving the shoes A LOT as well! We’ve found similar metallic silver court shoes from Dorothy Perkins for £20, this green cross body bag from Mario Pini on Yoox for £50, and a blue bodycon mini dress from Boohoo for £8. We love this effortlessly cool ’90s look Emma Roberts has in her Instagram. It’s a perfect outfit for the in-between weather the UK is currently experiencing, and is proof that tying a shirt round your waist doesn’t always look touristy! 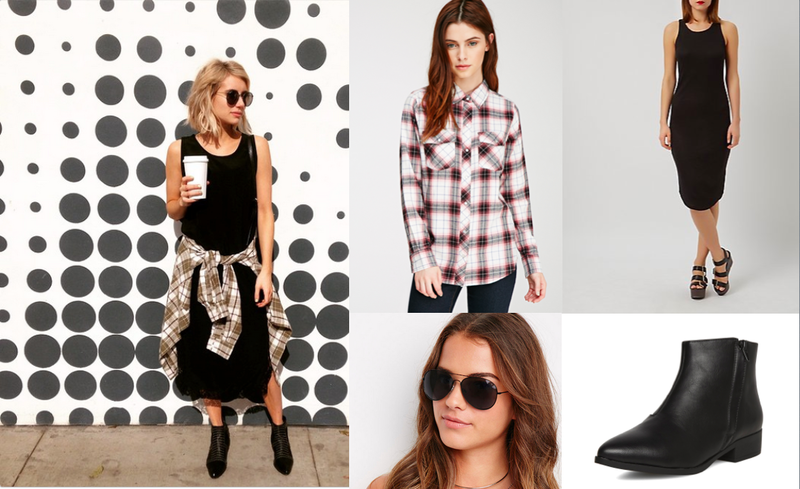 We’ve found similar boots from Dorothy Perkins for £8.50, a plaid flannel shirt from Forever 21 for £15, aviators from Forever 21 for £4.50, and a black midi dress from New Look for £9.99. Remember when Nicole Richie was the trashy chubby friend of Paris Hilton on The Simple Life? Who would have thought she’d turn into this beautiful stylish woman? This outfit is so lovely and simple, but Nicole makes it stand out with her pink hair, which you can get with semi-permanent dye if you’re not brave enough to go full steam ahead with it! We’ve found a similar white swing dress from Dorothy Perkins for £28, these cream court shoes from Lotus at House of Fraser for £59.99, and pink semi-permanent hair dye from Bleach London at Boots for £5.